"Open Field" is a recent small painting taken from some reference material collected last winter at the farm of one of my collectors. He had asked me to do a commission piece for him and while I was there I observed this view of his pastures as the clouds made a bid at hiding the sun from view. 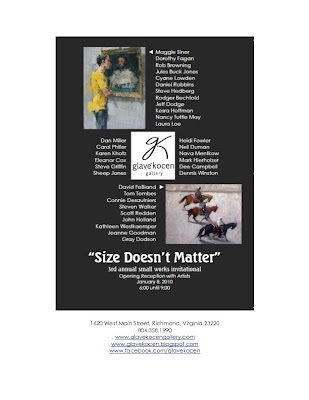 Glave Kocen is hosting a small works show this week and I will have two paintings on display. This has become an annual event and is the third year that the gallery has sponsored this show. 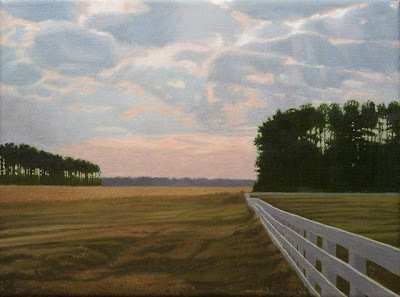 My paintings "Grey Barn" and "Open Field" will be available for purchase through the gallery.